Wouldn’t it be nice if I told you that you could lose weight by eating cake? But you can lose weight by eating heavy foods. Not high-calorie, low nutritional content foods, but foods that are denser than others. Heavy as in they weigh more. It’s not just calories and fat that helps you feel full. It’s also the weight of the food. Don’t believe me? Tell me how you feel after eating a whole bag of rice cakes? That’s not a full feeling, now is it? Your body needs the whole package. It needs calories, weight, fiber and fat before it can send your brain the message that it’s full and satisfied. 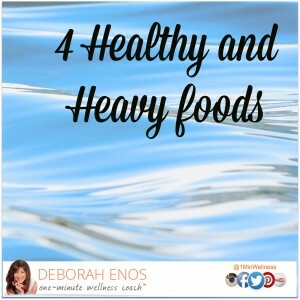 The key is to choose foods that are both heavy and healthy. Here are some ideas. Heavy Fruits – Oranges, grapefruits and apples are great choices. Try a fruit salad, you’ll be feeling full much more quickly than that heaping stack of rice cakes. Raw veggies – Broccoli is a great vegetable for when you want that full feeling. Enjoy it with hummus or ranch dressing and you’ll get the heavy with the healthy and a little fat. It’ll taste good and it’s good for you. Win-win. Raw cabbage salads are another great choice. Cooked veggies – Spinach, broccoli, cauliflower, cabbage and bok choy will all leave you feeling satisfied. Lightly grill or steam any of them alone, or cook them all together in a healthy stir fry. What’s the most obvious thing that’s missing from this list? Water – Sometimes when you’re feeling famished, it be difficult to tell the difference between hunger and thirst. Be sure that you’re drinking enough water throughout the day, and you’ll keep that full feeling longer. Bonus! My favorite 9 Minute soup recipe that I find to be high fiber, filling and heavy (in a good way of course! ).